Play video Was this over the line?Was this over the line? Play video Was this over the line? Another great FA Cup night on the BBC done and dusted then. Stay across the site for all the best of the action, reaction and of course the Third Round draw on Monday. Good night! Former England cricketer Graeme Swann: "Magnificent stuff from @Blyth_Spartans tonight. Me gran'll be proper made up like." Stevenage FC Official: Tonight's BBC FA Cup result means Stevenage FC will definitely make the long trip to Hartlepool on Valentine's Day. Who said romance is dead? Hartlepool boss Paul Murray: "In the first half we were pretty good but didn't take our opportunities. The second half was diabolical. There was no fight, no passion, we thought we had it won. That's been the story in the league as well. There were angry words exchanged in the dressing room. "I gather it was over the line [Marlon Harewood's shot] but that's irrelevant now. Credit to Blyth, they outplayed us in the second half. They had more passion and desire and that's not what I'm about as a person. I'm incredibly disappointed. "Where do you go from here? That's the question. My heart's still in it, I'm a fighter. Always have been, always will be." Stoke striker Peter Crouch on Twitter: So happy for Blyth Spartans, great interviews from the players after. The FA Cup's still got it! Which number has your team been assigned for Monday's FA Cup third-round draw? The draw, which sees Premier League and Championship clubs enter, will take place on 8 December and will be televised on BBC Two from 19:00 GMT. Holders Arsenal are ball number two, with their fellow 11-times winners Manchester United number 25. Warrington Town, the lowest-ranked team left in the draw, are number 55 providing they defeat Gateshead. Former England striker Alan Shearer, who was a losing FA Cup finalist with Newcastle in 1998 and 1999, will help conduct the draw. Ryan: Yaba daba do. Best game ever. Haway Blyth. It's worth it that my toes are dropping off. It certainly could happen Steven. That would be some tie! Don't forget you can watch all of the highlights at the top of the page. Kevin Ticehurst: The magic of the FA Cup is well and truly still a live. Amazing from Blyth Spartans incredible! Andrew Sheppard: They'll be dancing in the streets of Sparta tonight. Graham Pringle: Isn't it fantastic to hear local lads with local accents celebrating a famous cup win? Grassroots football as it should be. Steven Shearer: Imagine Blyth Spartans at home to Chelsea in 3rd round ... could happen. Plenty more action to come this weekend, and then the Third Round draw on Monday night. is our new-look FA Cup index. Great access for our cameras here to really soak up the winning feeling. Desolation I would imagine in the Hartlepool room though. Heather: They'll not be sat on Monday waiting for the draw, they'll be at work scaffolding, kitchen fitting, paper shop etc. Real football. Esther Bulmer: League teams might start getting nervous if they see the BBC coming! "I'm living off that goal for the rest of my life!" Iain Riddell: What a brilliant result Blyth Spartans and a true FA Cup classic. Who will the Spartans slay next? The Blyth players are back in the tunnel, releasing almost primal; screams of joy as they do so. The biggest night of their careers? You bet. It's not often you get a full film crew and photographers in the dressing room when you play in the Northern Premier. Number 52. That's the ball all Blyth fans will be keeping an eye out for in Monday night's Third Round draw. Goalscorer Jarrett Rivers wants Manchester United - that's 25. Check out all of the numbers here. "Hartlepool will be kicking themselves. The tie should have been over by half time with the chances they had." Shane Thomas: Have just seen what Trevor Sinclair's wearing on the #bbcfacup coverage. He's dressed like the guy in the pub who has all the best stories. James Forster: No player from non league Blyth or Hartlepool went down with cramp. Premier league players go down after 80 minutes. Blyth goal scorer Stephen Turnbull: "I said to the lads if we can stay in this game, these lads are getting beat week in and week out, and we have a chance. They are expected to batter us but we hung in there, sneaked a goal and got the other. We have an honest bunch of lads, everyone grafts. We are just buzzing. "My twin brother is playing on Sunday night for Gateshead and my sister is supposed to be having a baby on Saturday. It's quite a weekend." The entire away end is still full and booming with volume. Party time in Blyth! Nicholas Stuart Ward: Be a good pint in Blyth tonight. Blyth manager Tom Wade: "We battled hard, I used the bench well and what can I say? It was written in the stars. "We tried to keep the players calm at half time. We knew we would have a few chances and if we could stay in the game after 60 minutes we would turn them over. We have a very young side, they are a brilliant set of lads, their attitude is fantastic. It is a great night and I am so proud." Tim: Great to see an underdog win, Blyth played with passion unlike some of the higher clubs, eg. My Sky Blues. Mark O'Neill: Many congratulations to the mighty Blyth Spartans. The FA Cup is at its usual shocking best. Bruce Bowen: I tell you what the #bbcfacup are certainly bringing the magic of the FA Cup back. This is proper football. Andrew Quigley: Brilliant. Well done Blyth Spartans. Dom: First upset of many hopefully. "We have been down at half-time in this competition before, we are used to it. We have the team spirit and the fans behind us. It is unbelievable for a club like Blyth Spartans." Blyth boss Tom Wade is hoarse as you'd expect. He is beaming with pride. What a night for him. Blyth matchwinner Jarrett Rivers is lost for words as he describes the goal to Dan Walker and Alan Shearer. The biggest night of his life? Until he has to put leaflets in the local paper in midweek, anyway. He has weekends off, he confirms. He can celebrate tonight! "The celebrations are fantastic and nothing more than Blyth deserved, especially in the second half as they committed more men forward. Hartlepool will rue the chances they missed. The cameras came here to see an upset and they have not disappointed." A great image Adam. Apologies to Hartlepool fans but every neutral in the land will have enjoyed that fightback. Two fine goals too. Adam Lindores: Can't put a price on moments like this. "A brilliant strike from Matthew Bates but the deflection just took it onto the bar. They should have had a corner." It's all going on! There's a penalty shout and then Matthew Bates cracks the follow-up against the crossbar! "They look deflated Hartlepool. The biggest mistake they made in the first half was not going two or three up." Paul Lynch: We're the famous Blyth Spartans and we're off to Wembley. Dare To Dream. Thomas Graham: First Warrington, now Blyth Spartans! Two live games, two big cup shocks! Kieran Kirschner: I love the FA Cup. Two out of two for FA Cupsets on the BBC? Friday night nightmares for League Two sides so far. Can Blyth see this out? What a second half for the side from the Northern Premier. Sarah Taylor: Shut the stable door, seal the hatches and park the darn bus! Who cares if it's boring, a place in Round 3 is within grasp. Jarrett Rivers works in his mum's paper shop. He has just delivered for Blyth. What a goal! Another pitch invasion - they're all on there! Over 1100 Blyth fans in the ground tonight and most of them are on the field! Winger Jarrett Rivers runs at Matthew Bates, cuts in from the right and fires home. What a night for Troy Deeney, the Watford skipper bagging his second career hat-trick with a composed, controlled finish after being played clean through. Into the last five minutes then. Who wants to put a name on it? Psgmariner: 'Is this football or rugby?' asks the wife. Great question. Blyth have had 54% of the play in the second half but there are a few tired legs out there now. Some of the lads in green were at work at 8:30am don't forget. Was it or wasn't it? Make your mind up whether Marlon Harewood's shot was in or not by re-watching the clip in the 'highlights' tab above. Adam Wigham: Loving the coverage, I'm 16,000 miles away in Australia but this exiled Blythian's heart is currently overjoyed with the performance. Stephen: if Blyth get a winner I'll run around the street in my boxers. Gwann boys! Please, Stephen, think of the neighbours. Into the last 10 minutes. Another stunner? A slip? Goalkeeping error? I get the feeling there's another goal to come in this one. Marlon Harewood swivels to get a shot away - it's in front of Michael Woods but he can't meet it again. Harewood has been unplayable up top for Hartlepool. Jason: "Why don't we have goal-line technology in the FA Cup?" Lower league teams can't afford it, that's why. Blyth continue to push on, Hartlepool look rattled now. Approaching the last 15 minutes, can either side find a third goal? We want you to have your say on your BBC Man of the Match by voting on the right hand side of this page if you are on a desktop computer or at the top of the page if you are on mobile. The vote closes on 90 minutes and we will announce your choice as BBC Man of the Match at the end of the match. Dave Espley: "It's a goal" says Phil Neville, looking a a freeze-frame that shows, clearly, it isn't. Emma Douglass: Poor Hartlepool, definitely a goal. Connor Phillips: That wasn't a Hartlepool United goal, all of the ball didn't cross the line. Murph: So the FA don't have goal line technology in their own main competition? More tweets please to #bbcfacup or pop on to the BBC Facebook page. again and again to your heart's content now. "We saw the strength of Marlon Harewood there - that's a goal. I think that's a let off for keeper Peter Jeffries." Stephen Turnbull joins a list of great FA Cup free-kick goals - but how do you score THE perfect one? Is that in?! Marlon Harewood shows great strength to hold off his man and get a shot away, goalkeeper Peter Jeffries fumbles it and desperately extends an arm to claw it away from on the line. But was it over? So, co close - impossible to clearly call. Edwardian: Didn't realise David Beckham played for Blyth Spartans! Cheer up Arron, still half an hour to go. Hartlepool look rattled. First Michael Woods gets caught in midfield and then keeper Scott Flinders collides with his own defender. Boss Paul Murray looks livid with his side on the bench. Phil Joy: What a free kick, what a goal for Blyth Spartans. Daniel Woodley: What a fantastic strike that is from Turnbull! He won't ever score a better goal. Come on Blyth! Shock is still on. Marc Bazeley: Nice retro touch of someone throwing some bog roll on the pitch. You don't see much of that these days. Indeed Marc. More tweets please to #bbcfacup or pop on to the BBC Facebook page. "He didn't have much to aim for. To get the ball up and down like that - it gave the keeper no chance. He probably went to bed last night and was dreaming of scoring a goal like that - right in the stanchion." Jen Cornell. PMA - Positive Mental Attitude. If it's good enough for Linford, it's good enough for us. Game on now. Hartlepool had a bad 10 minutes and that goal was coming. Brilliant! There'll be dancing on the streets of Blyth tonight as Stephen Turnbull scores one of the FA Cup goals of his time! A pitch invasion from the bench as the former Hartlepool man bends in an absolutely top class free-kick. He's 25 yards out, gets it over the wall and right into the top corner. Jen Cornell: "We're still feeling positive!! C'mon the Spartans!" Lauren Sasha: More feline connections, the comic Get Fuzzy features a Siamese obsessed with monkeys and has an article about Hartlepool's monkey incident. Right, back the the footie, we're begging you. It's all opening up. Blyth seeing plenty of the ball and time and space out there too. Again, they just lack conviction and quality on the ball as captain Robbie Dale eventually shoots but it's easily blocked. "Blyth have worked it well down the right. They have come out and played with more tempo and intensity. They are committing more support to Daniel Maguire up front." Andrew Gardner: Alan Shoulder was my first football hero. I went to Jamie McClen's sister's fancy dress party as him. We're sure Alan will be delighted. Blyth force a corner. For Sparta! Good defending from Marlon Harewood. Blyth then play a short corner with predictable, terrible results. Has a lower league side ever scored from one? Not that I've seen. How about this for a selfie to brag to your mates about? Louis Marchant gets a quick piccy with with the BBC's Alan Shearer. Frazer Briggs: "Doing teas at the game..."
Matteo Lanzoni is still off, he can't stop that nosebleed. That's the touchline coaching of Blyth boss Tom Wade. Churchillian. A stoppage as Hartlepool defender Matteo Lanzoni has some running repairs to his face. Took one on the bonce there. He'll be fine and we play on. Alan Shearer's choice of coat is causing almost as much discussion as the footie at the moment. Rhys Bennett: Did Alan shearer pinch his coat from these fellas? We are back under way! Players back out. Can the non-league side get back on track? Dan McDowell: Watching the #bbcfacup and noticed that one of the official Hartlepool United staff is wearing a Philadelphia Eagles beanie. Bizarre cross-promotion. I like it. Sam McIvor: Why is Alan Shearer dressed as an arctic explorer? Back under way at Craven Cottage. Alan Shearer has just been wowed by a stunning goal from Worcester City's top scorer Sean Geddes. Geddes scored with a "rabona" lob in his side's 3-0 win over Barrow in the FA Trophy. "Blyth manager Tom Wade should be delighted. If they are going to get anything out of the game then they need to get more support up front for Daniel Maguire." "I think the first 10 minutes, with Hartlepool on top, you can put down to nerves on Blyth's part. "But once the pattern of the game became clear, Hartlepool looked more athletic and the difference in fitness showed." Blyth will be kicking towards their 1200 noisy fans in the second half. That could make all the difference. They've seen what Hartlepool are about, what they've got to offer, and now they go again. "It should be all over for Blyth. But with Hartlepool's defence I'm sure at one stage they will get a chance in the second half. Because of Hartlepool forward Marlon Harewood's age - he's not often going to run away but he is big and strong. If they don't get protection for the defence then Marlon will get the ball and lay it off." "The front three for Hartlepool have been absolutely outstanding, good running off the ball throughout the first half, and great delivery." Hartlepool had 10 efforts in that first half and really tested Blyth at times. The non-league side came back into the game in the final few minutes though. Get an early goal and the tie is back in business. "I think Hartlepool started really well. They've got pace in wide areas and causing Spartans lots of trouble. Marlon Harewood - they can't handle him. Blyth started really nervously but came into it in the last five minutes." If you missed the only goal of the night so far, you can see it again at will by clicking on the 'highlights' tab at the top of the screen. Ian Wills: Did Hangus the Monkey just try to pull down the shorts of the Blyth thrower? Blyth have a corner. Delivery! It's a good one which Hartlepool keeper Scott Flinders juggles, as we always see though he's rescued by the referee's whistle. Lucky man. Blyth captain Robbie Dale is seeing more and more of the ball. He can beat a man, the barman. They need to get him on the ball as much as they can. After the earlier bombshell revelation from Duncan Gates that his mum's first cat was named after Hartlepool manager Paul Murray, we have another feline-based entry. More tweets please - about footie or cats - to #bbcfacup or pop on to the BBC Facebook page. Kit Symons wears the look of a man whose side have just been totally trousered in that first half. Watford three up and a man up too after Marcus Bettinelli was dismissed. Damage limitation tome already for the Cottagers. Chris Hunter: Alan Shearer's team talk not working. Harsh on big Al, it's not even half-time yet. Can't see frozen peas taking off as a matchday snack Steve. Good luck to you though. Blyth having a good spell now - can they sneak one before the break? Steven Hinchcliffe: At home with a bag of peas, cheering Blyth Spartans. Will Stanser: Me and Jordan Phillips getting fat while watching the FA Cup. Scott Flinders you lucky man! Robbie Dale puts a cross over which the Hartlepool keeper fumbles - and it trickles just wide! Almost a calamity. From the following corner Daniel Maguire has a good chance but heads right at Flinders. Got to score! Marlon Harewood should bury this one after more good wing work from the slippery Sidney Schmeltz. The Dutchman gets clear of his man, chips it in and Harewood heads into the side-netting. Big opening. Jon Wright: Love numbers 1-11 on the back of shirts much better than squad numbers. Jason Tucker: Thinking that the Blyth lads have chosen the wrong footwear for this pitch! Like watching dancing on ice at times! Marc Bazeley: Tom Wade is definitely the sort of manager who writes his team down on the back of a packet of Woodbines. "It was always going to come down the right-hand side. It was a brilliant ball from Neil Austin and good link-up play from Marlon Harewood." Garry Halsey: Watching the game from my hospital bed. Neil M: Wonders of modern technology. Relief in the stands as League Two Hartlepool take a deserved lead. A good move down the right sees Neil Austin stand up a chip from right on the deadball line, Jarrett Rivers switches off at the back post and Jonathan Franks arrives to plant home a header. Watford are blowing Fulham away! Disastrous defending from Fulham though as they try to play offside, Troy Deeney is in and pokes the ball past the jogging-bottom wearing Gabor Kiraly. Blyth go direct for the first time and it almost pays dividends. Jarrett Rivers causes havoc chasing a long ball and the loose ball runs on to Daniel Hawkins. He chances his arm with a first-time effort from 30 yards but it's always drifting wide. The non-league side coming on strong. Blyth manager Tom Wade on MOTD: "We've done exceptionally well - I thought in the first 10 minutes we'd get blown away. It's tough - they've got lots of quality. They're not a bad side. I think the game is beginning to settle a bit though." Hartlepool continue to look slick in possession. On this early viewing I'd suggest that midfielder Michael Woods could do a job a lot higher up the football pyramid. "I've been impressed with Hartlepool - when they get to Blyth's box they play delicate little one-twos. Marlon Harewood has caused problems so far." Marc Bazeley: Looks like I'm a Blyth Spartans fan for the night then. Good work Marc - we like a man who dresses up. On reflection that sounded a bit weird, but you know what we mean. A four-man committee over the ball - Daniel Hawkins takes it in the end, his free-kick is deflected off the wall and Pools keeper Scott Flinders has to make the save. Hartlepool then put together a brilliant counter-attack, Marlon Harewood laying it off to Sidney Schmeltz - who crosses when a shot was on. Put your foot through it! Newcastle United Foundation: Wishing our part-time community coach, Alex Nicholson, the best of luck in the Hartlepool vs. Blyth match tonight. Blyth right-back Alex is a busy lad. As well as all his footie commitments, he works as a clothes designer. The Spartans put some neat football together but it falls down in the final third. They could do with a set-piece to get the ball in the mixer. The Blyth fans just beginning to fall quiet after an hour of solid noise. Their side are struggling to keep hold of the ball, the League Two side look a class above so far. "This is the only ground I've been to where I've been applauded." Neville responds to calls from the crowd to give them a wave. Zavair Baakza: Being non British I never understood the obsession with FA Cup. Seeing this match is a revelation. Pure football with conviction! Jason Tucker: You just get the feeling that the first big chance Blyth get they will score despite being under the cosh. Duncan Gates: Aww, just realised that Hartlepool are managed by late 90s QPR legend Paul Murray, after whom I named my mum's first cat. What a touching story, Duncan. More tweets please at #bbcfacup or pop on to the BBC Facebook page. "I watch a lot of non-league this season - I've been impressed with the technical quality. But fitness is an issue. Warrington players against Exeter in the last round went down with cramp in last 30-40 minutes." Two good chances for Hartlepool, who continue to push on hard. First, midfielder Michael Woods runs on to a neat through ball but drags a shot wide, before Jonathan Franks has a close-range header well blocked. The League Two strugglers have started really well. Troy Deeney makes no mistake, sliding the penalty home. A terrible few moments for Fulham as they now go down to 10 men! Goalkeeper Marcus Bettinelli sees red, taking out Matej Vydra. And that's a penalty too. Contributing to the live page and watching on screen, good work there, Martin. You can watch the game live on BBC One or on this page. If we said there was a lot of concern about the kits on social media tonight, we'd be understating it. Liam Keighle: How is this not a kit clash?! James Hewitt: Erm..... Kit clash much? Stephen Lodge: Too many stripes. And there's many, many more. To clear things up, both teams are in white-striped shirts. Pools in blue-and-white, Blyth in green-and-white. The away fans go nuts at Craven Cottage as Watford take the lead. Midfielder Almen Abdi slams a free-kick right through the wall and into the net. Blyth skipper Robbie Dale has scored in every round so far and is not short of confidence - trying a first-time volley from a full 30 yards, but the ball screws away out for a throw-in. The non-leaguers just need a spell of play. "It was a magnificent save. It was a brilliant cut-back from Jonathan Franks for Sidney Schmeltz." You're quite right Jonathan - Michael Woods made two appearances for Chelsea in the FA Cup and he's still only 24. On the way back up? Pools well on top. Jonathan Calder: Michael Woods playing for Hartlepool? I remember him coming on as a sub for Chelsea. Jonathan Woodrow: Enjoying the coverage. Interesting back stories, well-presented. Shearer is loving life and Sinclair conducts a decent interview. Wayne Sharpe: Forget Shearer. I once spent six months living/working in Hartlepool years back. Love the place ... especially Chicago Rock! The away fans still making plenty of noise - but Hartlepool's strong start could take the wind out of their sails. Sidney Schmeltz is a box of tricks, bursting into the box again and winning a corner. What a save! One of the great FA Cup stops! OK, maybe a bit strong - but that is brilliant! Blyth keeper Peter Jeffries hurls to his left and somehow keeps out a fine header from Sidney Schmeltz. Tremendous stop. Daniel Woodley: Absolutely fantastic away support for Blyth Spartans tonight! Hope they pull off a cup shock. Scott Hunter: Would love to see Blyth Spartans win and get Newcastle away in the third round. Anthony Baldock: Surely they are not both playing In kits with white stripes? Afraid so Anthony, better put your spectacles on and move the chair a little closer to the tele. More tweets please at #bbcfacup or pop on to the BBC Facebook page. Hartlepool start very well, former West Ham striker Marlon Harewood sliding in Michael Woods - but he's stopped by a decent tackle. Blyth looking to keep the ball on the deck. Game on! Who will be in the draw for the Third Round? Leslie Ingledew: 2-1 to Blyth even though I'm a Hartlepool United supporter. Now we know footie fans are pessimists at the best of times but come on Leslie, surely things aren't that bad? "There's a real, real chance of an upset. The fans want it to happen and they expect it to happen. There are goals in Robbie Dale and Daniel Maguire. Those two guys and manager know Hartlepool concede goals and they concede too many." Football Remembers Week is to commemorate the centenary of one of the most iconic moments of the First World War - the 1914 Christmas Truce football match. For the matches that take place in the Premier League, the Championship and the FA Cup second round, all 22 players who start the match will pose together in a group photograph as a mark of respect to those that played in the 1914 Christmas Truce match. Teams are being asked to upload a pre-game photo this weekend to social media with the hashtag #footballremembers. Steven Liggett: Not sure that flash harry hat will go down well in Hartlepool, Trev. Blyth manager Tom Wade: "We've had long training sessions in the freezing cold. It's my home town club - I never dreamt that this would happen. It's a fantasy - massive chance to go through." The teams are in the tunnel. Referee Andy Madley lines them up - let's do this! Under way at the Cottage. "There are going to be thousands outside and more watching at home on the BBC. Someone today is going to be a hero, make sure that hero is from this dressing room." "Hartlepool's league form has been awful. They have won one in 13, but this is a great opportunity for them. There is no pressure." The teams are out at Craven Cottage. Almost go time in tonight's football. "I've noticed the quality in lower leagues is good, it's just the consistency and reproducing it week in week out that makes the difference. "If Blyth don't freeze on the night, they've got every chance because there isn't much between the two sets of players." Freeze mentally - or physically? The BBC cameras have followed Blyth midfielder Matthew Wade all day as he did a morning at work, then got a haircut before heading down to Hartlepool. A plush pre-match meal at 16:00 - push the boat out lads. Anyone following Alan Shearer's pre-match routine of chicken and beans? "The FA Cup is a welcome distraction for Hartlepool. The pressure is on them, but it's a huge incentive for them to get through." "I think without a doubt history can help Blyth - they know they can actually do it. It's a young team - can't seem to be any pressure on those guys. They come up against a team that's really struggling." 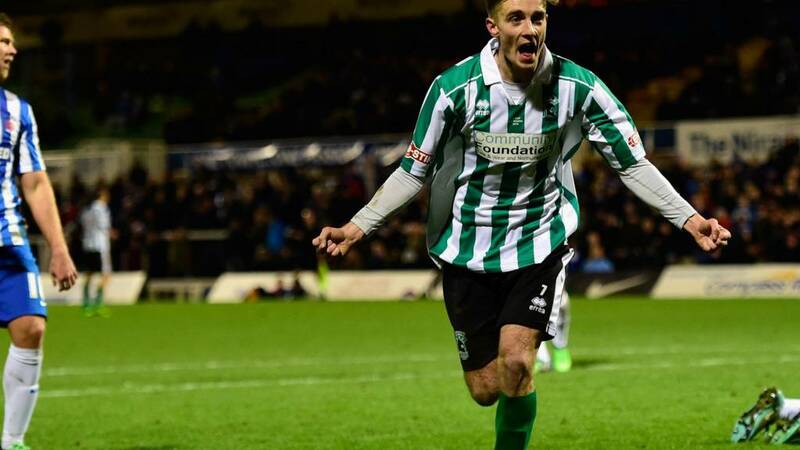 Blyth Spartans boss Tom Wade: "Tonight we have an even bigger support and we have lads travelling from Cannock, Stoke and Coventry so the support is massive. It will spur the lads on, we need our supporters to feel like it is a home game and they will do that. "They have to know just how important they are to us and if we are to win we have to realise we are all in this together"
Hartlepool are bottom of the league and facing the humiliation of a potential Cupset tonight. Pools have almost nothing to gain tonight. Can they deliver the goods? Dave Smith: Many neutrals tonight - especially the national broadcasters - getting a good old chill from the North Sea. Best selfie of the night so far? Very possibly, courtesy of H'Angus the Monkey, Hartlepool's official mascot. Julie Guest: "I have a relative who has only missed one Birmingham City game for over 60 years, the only time he missed one was when he had an operation!" Steve Ackling: "Having been an avid Hull City fan since 1966 I was delighted when my youngest daughter, Jo, discovered a love for football but just a tad disappointed when she chose local club Derby County as her team rather than my beloved Tigers. I could only see one answer to this dilemma - get season tickets for both clubs! "And so 2002-03 was the start of a 7-year feast of football in which we went to 309 Tigers and Rams games, witnessing four promotions and two Championship play-off final wins. Oh, and Derby County recording the lowest ever Premier League points total!" Blyth are led by Robbie Dale, the barman who has scored in every round of the cup so far. Peter Jeffries, a former Hartlepool season-ticket holder and scaffolder, is in goal for the Northumberland side. The starting XI also includes midfielder Jarrett Rivers, who works in his mum's newspaper shop, and student midfielder Stephen Turnbull, who is doing an apprenticeship with a ferry company. Hartlepool make four changes to the side that lost 3-1 at home to Wycombe. Jonathan Franks and Sidney Schmeltz come in to join former Newcastle United forward Marlon Harewood in attack. Blyth Spartans XI: Jefferies, Nicholson, Watson, Hutchinson, Buddle, Turnbull, Rivers, Wade, Hawkins, Maguire, Dale. Hartlepool XI: Flinders, Austin, Bates, Lanzoni, Jones, Featherstone, Woods, Walker, Franks, Harewood, Schmeltz. Spartans manager Tom Wade was one of the members of the 42,000-strong crowd at St James' Park when Blyth were beaten 2-1 by Wrexham in the fifth round in 1977-78 - the 55-year-old is a lifelong supporter and started going to matches at the age of eight. It will be his 100th match in charge of Blyth against Hartlepool and the club also runs in the family - his son Matthew plays in midfield. John Shaw: "For Middlesbrough's first-ever FA Cup Final appearance at Wembley in 1997 I had to fly back from Hong Kong the night before the game and, pretending to be a Chelsea supporter and heavily disguising my accent, bought a Chelsea section ticket at Stamford Bridge which I managed to exchange for a Boro ticket just before the game. "After the National Anthem and the presentation of the teams, I was about to sit down to enjoy the game when a certain Roberto Di Matteo blasted home after just 42 seconds. Never easy being a Boro fan! Less than a day later I was back in Hong Kong, not even jetlagged, just shellshocked." Hull goalkeeper Steve Harper: Having played for Hartlepool & also against Blyth a few times it's certain to be a feisty cup tie at Victoria Park tonight. Talismanic forward Robbie Dale, who has scored in every round so far, is a key component of Blyth's hopes of FA Cup progress. "He's a bit of a maverick on the park. When he's on his game, he's unplayable," manager Tom Wade told BBC Newcastle. "He leads from the front, like an Alan Shearer sort of captain and when he's on the pitch everybody looks up to him. We've got a lot of young players in the side with ambition and he helps them come on." "Wembley! Wembley! We're the famous Blyth Spartans and we're going to Wembley!" That's the first time I've heard that chant this season. Good work from the away end. A few too many syllables if I'm being picky. A non-league side fancying a big Cupset would consider Hartlepool a decent draw. Pools are bottom of the Football League, 92nd out of 92, and have collected just 12 points all season. Boss Paul Murray says: "It is natural that everybody wants an upset. "That is why the cameras were down at Warrington in the first round - it is what it is all about - and why they are here. "A lot of people will be wanting an upset but it is our job to make sure that doesn't happen." Jordan Wright: Absolutely buzzing! Howay Blyth! Mitch Mansfield: Fulham v Watford, Dortmund v Hoffenheim, Fiorentina v Juve or the FA Cup? A Friday night dilemma, but BBC FA Cup had me at Blyth Spartans. Warrington Town made light of a 100-place gap between themselves and Exeter in the football pyramid to win. Will Blyth manage another shock tonight? Kieran Goldberg: "If the Blyth Spartans fan is worth a long story then so is Barnet's Steve Pursey. If I am not mistaken he has missed one game in the last 35 years, a game which was initially postponed, then changed to a delayed kick-off later that same afternoon. "Not only does he attend every home and away game for the Bees, he now takes an active part in the supporters club, arranging coach transport to games for fans." Andy Tillen: "I've not missed a Hampshire Sunday league match home and away since August 1975. Also my friend Paul Black hasn't missed a Reading game home and away since 1974." One game in the Championship for us to worry about tonight. A few weeks ago Fulham were struggling at the foot of the table and Watford flying at the top. But Kit Symons has transformed Fulham's fortunes, guiding his team to seven wins since replacing Felix Magath. Watford, on their fourth manager of a bizarre season, seem to be heading in the opposite direction, Slavisa Jokanovic's men down to seventh after losing their last four. "We have not had good results and it's our obligation to stop that," says Jokanovic. Can they? We'll find out soon. We are almost set for the beginning of Round Two of the FA Cup - and you won't miss a thing. As well as being able to watch at the top of this page, you can tune in to BBC Two for live coverage from 19:30 GMT. Steve Wilson and Phil Neville are behind the microphone, while former England captain Alan Shearer and ex-England winger Trevor Sinclair will be pitchside. Blyth fan Jeff Young hasn't missed a game since 1987. But who is the most dedicated football fan you know? Who has ducked their own sister's wedding for Yeovil away? Who continually avoids parents evening for a JPT regional cup tie? What's the most games you've rattled off in a row? Send us your stories of fanatical fans, super supporters and unbelievable ultras. A win tonight and Blyth will be in the Third Round. The promised land for all non-league sides, and potential ties against Newcastle, Manchester United or Chelsea could await. Taking on one of the big boys could even be Jeff Young's finest hour. His favourite game to date was !a Northern League game away to Murton (a former mining village near Sunderland) in the early 1990s." Read more from Superfan Jeff Young here. Spartans super fan Jeff Young has not missed a game since January 1987. NINETEEN EIGHTY-SEVEN. Twenty-seven years of consecutive games, totalling 1,506 before tonight. We've all met the odd dedicated individual down the years, but Jeff really is a special case. Jeff has seen three promotions - from Northern League, through both divisions of the Northern Premier League, to the Conference North - and one relegation, back to the NPL. There have also been famous FA Cup ties, including a 4-3 defeat at Blackpool in the first round in 1997, and a run in 2008-09 that ended with Spartans losing 1-0 to Blackburn Rovers in the third round. Blyth ply their trade in the Northern Premier League Premier Division, and are used to facing the likes of FC United, Trafford, Belper Town and Rushall Olympic. "It's here & so is Hangus the @Official_HUFC mascot #FACup."